This week’s minorities in cartoons entry is “The Zeta Project,” a series that ran on Kids’ WB from 2001-2002. 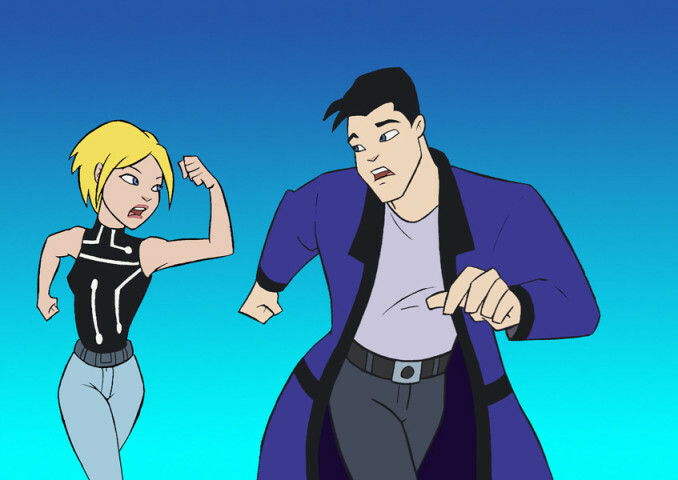 The series was set in the same future as “Batman Beyond.” “The Zeta Project” was largely in its own setting well away from futuristic Gotham City, though Batman appeared in a few episodes. The show’s overall plot was about Zeta, a robot assassin used by the US government (specifically, the NSA) to carry out covert assassinations. Zeta’s aided by an array of weaponry and his ability to holographically disguise himself as a human. However, Zeta soon realizes what he’s doing is wrong, and (after dropping most of his weaponry) flees his government “bosses.” This leads the NSA to assume he’s been subverted by enemies/gone rogue and is a dangerous threat. Subsequently, the NSA sends a team to track down and capture Zeta. Joining Zeta on the lam is Ro, an orphaned teenage girl. Zeta and Ro attempt to find Zeta’s reclusive creator to try to prove his innocence, before the NSA can capture Zeta. Along the way, the two have various adventures. One of the NSA officers includes Agent Lee, a level-headed agent compared to her boss, Agent Bennet (the head of the NSA team sent to capture Zeta). At first, Lee pursues Zeta, but eventually realizes he’s not a threat and decides to quit. She’s soon replaced by the more compliant Agent Rush. Another government official that appeared in the series was Colonel Lemak, Bennet’s supervisor. There’s only been a DVD/digital video release for the first season so far. Finally, here’s “The Zeta Project”‘s opening credits. Next Post:Reddit plans to deal with its racist content by… sticking a curtain in front of it?